The SmartShutter® is designed to complement our growing line of optical products and sets a new standard for shutter performance and reliability. In the traditional shutter design there are two or more “leaves” that rub against each other. Given time, the blades will wear down, bind, and the shutter will fail to open. The SmartShutter® is designed with only one moving part, which virtually eliminates the effects of wear and markedly improves performance. In the traditional shutter design there is an additional issue of the leaves binding in extreme temperature conditions. Our improved design uses heat resistant material that performs well under very high temperature conditions, extending the life of the shutter. The SmartShutter® incorporates a new high-performance motor drive and precision stepper-motor to provide added control and durability. Traditional shutters use a solenoid actuator requiring a high initial opening voltage for rapid opening of the shutter. This can overheat or burn out the coil of the shutter if the shutter is opened too frequently. With our microprocessor controlled motor/wiper design, we can control the trajectory of each move and optimize the motion of the blade for speed or for smoothness. The SmartShutter®, in either the 25mm or 35mm version, operates with open/close times of 8msec from the command (3msec from the start of motion). Since our robust design does not rely on over-driving the windings, we can achieve continuous operation at frequencies up to 35 Hz for the 25mm version, and 20 Hz for the 35mm model. Because the shutter blade is stopped by the action of the motor rather than mechanical stops, SmartShutter® units tested for over 10 million cycles show no sign of failure. The microprocessor-based controller provides exceptional versatility and is adaptable to various modes of operation and function. The SmartShutter® can be programmed for a variety of movement profiles or to produce a variable aperture by determining the degree of shutter opening. When used in our Lambda LS xenon light source and coupled with a liquid light guide, the shutter acts as a programmable neutral density filter. In addition, while the impulse of our shutter is minimal, a “soft” action mode can be selected to decrease vibration. The SmartShutter® controller is capable of driving up to two shutters. To support this function a TTL input is supplied for remote triggering of the shutter, as well as a TTL output to support remote triggering of external devices such as a camera. The controller can also be operated locally (manually) from the controller keypad or remotely from a computer through either the USB or serial port, or opened and closed using a logic level input. 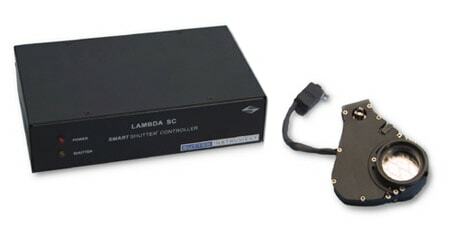 The SmartShutter® also accepts commands to the Lambda 10-3 and Lambda 10-B controllers. Originally designed to be integrated into our 25mm and 35mm filter wheels, housings are also available for stand-alone units and for use with our Lambda LS and Lambda DG-4/DG-5 optical products. The modularity of the SmartShutter® assures that repairs, should they be necessary, are simple and economical.